We assembled for breakfast in the glitzy dining room and were a little disappointed to see the wind blowing so wildly. The TEAM meeting was after breakfast and we got away to meet Marco in the marina all dressed in out matching gear. I forgot to mention our team gifts which make up out team uniforms. Francesco had two T Shirts made for us – day and evening wear! All printed up with a great logo and our names on the back. Then Ben (Chris’ brother from the USA ) handed out theft shirts he had made. Not to be outdone Steve produced the shorts in a wild red and yellow print that had been so popular last year. So off we went all dressed matchy matchy! We drove for about half an hour through the wind, north of the township of La Maddalena. Finally found a beautiful bay where we could start our swim. Just like last year I went in the rubber ducky with Francesco and he dropped me half way along the swim so I would have about a 2 km swim and the others a 3 and a half swim. Off I went On my OWN! No pals to swim with as Phoebe decided to swim with the boys! What a goer she is. 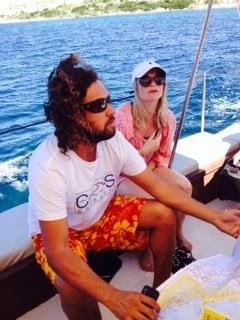 At the end of the first swim I was dropped off and a taxi was waiting to take me to La Maddalena to meet Berti, Fabio and their little girls Cleo and Demi. We had a lovely lunch together and happened to meet Chris from London walking along with his suitcase. After lunch we went for a drive around the island, something I didn’t get to do last year. It has the most spectacular views. Back to the hotel we took the girls for a little swim in the hotel pool while waited for Steve to return. So much fun seeing them and the little girls are just gorgeous. keeping an eye in her. Not sure she paced herself for the first day. Fear she will suffer tomorrow. Another big sleep in our very comfortable hotel room.